Is a “kind” defined by a common gene pool? Is a “behemoth” a reference to a dinosaur? You might think so based on a very popular Bible study aide. I was looking up the etymology and usage of some Hebrew words at the Blue Letter Bible a few days ago and noticed some interesting notes added to the lexicon and usage information for a few terms. The first one that caught my eye was the definition and note added to the Biblical usage section for the Hebrew word miyn translated after its kind in Genesis 1. Below is a screenshot. Notice the language in the text box here. This verbiage is straight out of a young earth creationist (YEC) handbook. It speaks of information being lost but not gained which is typical YEC wording to describe how organisms are decaying due to the effects of sin. It carefully tries to define a kind as never being able to give rise to new kinds but species in a kind can give rise to new species. All of this is the new language of creationism. So here we have a strong YEC influence on the context of how a term should be interpreted. The translation into the English after its kind comes from a root word meaning to portion out. The text therefore says that God portioned out living things but this hardly tells us how that portioning was done. Unfortunately the scientific definition of kind presented here does not come from the Scriptures but is an anachronistic reading of modern science back into the text. Does it matter? I think it does. This is a very popular online Bible research resource that is influencing the way we understand particular words in the Bible and thus the meaning of the Bible itself. Creationist literalists tend to read far more into the text than is there and then expect that their views be viewed as the only orthodox understanding of the meaning of the text. But this isn’t just a Blue Letter Bible phenomenon. I tried to find out where this language came from and who inserted it. In searching I discovered that multiple other Bible reference sites also have the exact same definition and usage notes associated with the same Strong’s concordance number. It seems that this language has been inserted from some central database from which many websites are drawing data. Unfortunately, I also quickly found that this definition of kind has been repeated hundreds of times on blog discussion forums with many assuming that this genetic definition is exactly what the Bible means by kind. This definition if them been used to show that the Bible clearly denies any form of evolution since this is what a kind is. But this nonsensical definition is far from inspired and clearly goes way beyond what we can know using the Bible to interpret the Bible. Is a Behemoth a Dinosaur? This creationists influenced definitional note is not the only one I found. I very quickly found a second example. 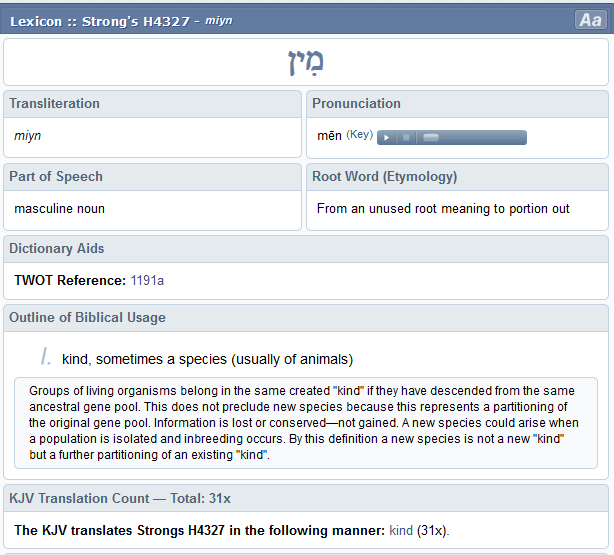 This one is under the Strong’s concordance information for the Hebrew word translated Behemoth in our English Bible. See my screenshot below. This type of rhetoric is again right out of young earth creationist literature. It bothers me because I know the literature in this area and most biblical scholars would not conclude that this term refers to an extinct dinosaur and yet it is presented this way here as if it were the consensus view. So who has made the decision to use a definition that is less popular among scholars. Who generates the information that goes into the Strongs database these days? Obviously someone who is strongly influenced by, and familiar with, the creationist literature. Unfortunately this type of misinformation, in my opinion, is being copies over and over again and enters into sermons and future books and papers because the Strongs lexicon is considered an authority of careful scholarship and thus is not often questioned. If you see other examples of this please let me know. I would be interested to see how often this young earth bias is being promoted on sites like the Blue Letter Bible. Addendum: See comments below for some feedback including evidence that Institute for Creation Research has some influence in these comments. « Ken Ham’s Aversion to ‘Life’ on Other Planets, Part I – What is Life? Should you not be bombarding the concordance editors with searching questions about where they get, and how they have evaluated, this twaddle? Both your examples are imposing definitions on Hebrew words that are, to borrow a phrase, “patently absurd”, in order to advance a toxic agenda. And neither of the proffered definitions have any scholarly basis whatsoever. Good point. I am hoping that others have some additional examples. I really would like to know who makes these decisions. There are some folks who follow my blog that will probably know. Christianity Today has just come out with a new magazine called “The Behemoth”. The article explaining the name is an interesting exposition of the Job passage and how it fits a hippo. Ah, I should have mentioned that in the article. I read that article, it was quite good and I probably had that in the back of my mind when I saw the notes about behemoth. Thanks for providing the link. I may go back up and add that to the post. I actually really like the idea that the behemoth is an unknown animal rather than being a hippo or a sauropod. In all honesty, I have come to view the book of Job as purely allegorical – most likely representative of the Jewish state at the time and designed to show the majesty of God to a people who have strayed (as the hebrews regularly did.) And the Behemoth could be any number of things – including an extinct dinosaur that God decided to show Job (or the authors) a vision of. I assumed this must be something new, so I went into my 1999 edition of BibleWorks and looked up “kind” and “behemoth” to compare. Lo and behold, the Strong’s definitions given with the KJV are identical to what you showed, However, the comments are not present, so they may have been added more recently. I think I sense a reason for the bias. Incidentally, BibleWorks also has TWOT (Theological Wordbook of the Old Testament), which is cited in the Blue Letter Bible, and gives more standard scholarly definitions and comments, if anything with an OEC bias. It describes Behemoth as a hippopotamus or elephant, with a long discussion of issues surrounding the translation. Great stuff. This is very interesting and helpful. Thanks for sharing. Larry Pierce based it on an abbreviated Brown Driver Briggs and you will find versions of it spread across online bible study websites and as free downloaded bible modules, often described simply as Brown Driver Briggs Hebrew Definitions. Who authored the definitions in the OLB lexicon? 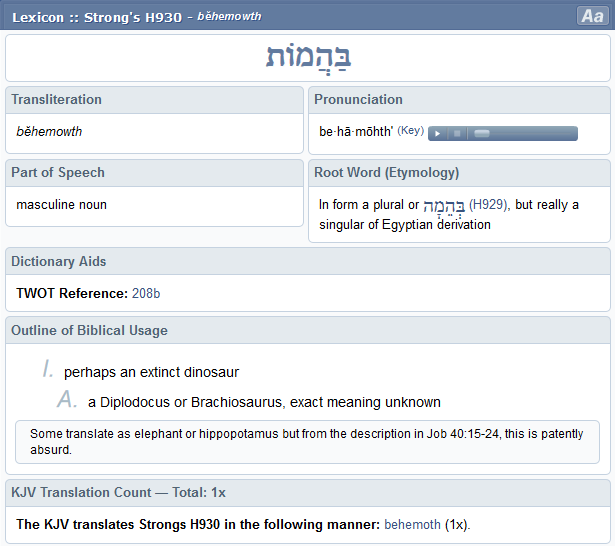 Behemoth is the plural form to the Hebrew word behema. Behema is translated in Genesis 1-2 as “cattle” or “beast” of the field. Of of my Hebrew profs said it is probably best to translate Behemoth as “The Animal” with a capital A. In doing linguistic research related to biblical terms I have found that there are errors due to preconceptions about what the text means. These study tools do not reflect the latest linguistic research. Today Hebrew is recognized as an Afro-Arabian language and the meanings of many of the oldest Hebrew roots are found in African cognates. For example, ha-rison-iym (ancestors) in Psalm 79.8 is related to the Ijebu word lisa (first in rank), to the igbo word olise (God as in Olisemeka), to the Arabic ras, the Aramiac resh, the Akkadian rishu, and the Yoruba orisha. Min among the ancient Nilotic peoples was a symbol of the life giving seed that comes from the Creator and gives life to growing things on earth. However, the term min [מִין] is never used in the Bible in reference to humans. Humans are unique. They are made, not as plants from seeds, but molded in the image and likeness of the Creator. This is why onanism was considered such a great offense against the Creator. The seed that should fall to the earth is the seed of plants, which spring forth from the earth. The seed of man should fall on his own type (the womb), from which man comes forth. Clement of Alexandria wrote, “Because of its divine institution for the propagation of man, the seed is not to be vainly ejaculated, nor is it to be damaged, nor is it to be wasted” (The Instructor of Children 2:10:91:2 A.D. 191). To me, there are only two ways of referring to a trunk on an elephant: it looks like a large swaying tail or it look like a very long, flexible, prehensile nose. Indeed, someone seeing an elephant for the first time may describe it as having a small tail at one end and a BIG tail at the other. If close enough to see the eyes and mouth, the observer might speak of a big powerful, flexible nose that sprays that entire Jordan river, which it just drank, all over its back. That’s what we see in job. I find NO description in the passage which does NOT fit an elephant. The statements about the “stones” may simply be an assumption that such a huge animal also has huge testicles. Of course, an elephant DOES have large testacles but they are internal where they can’t be seen. Of course, the poet doesn’t have to see the elephant’s large, strong bones to compare them to metals, including big iron bars. Of course, the people are ICR and AiG are neither scientists nor Biblical scholars. So their simplistic protests of “Absurd!” at the conclusions of most Biblical scholars says much about their hubris but nothing about how or why they think the passage CANNOT be about an elephant but probably is a “dinosaur” (a very large category of animals or varied types.) What “clue” leads them to assume “dinosaur”? Just its size, even though most dinosaurs were NOT large.